Tucked behind the trees and foliage on Franklin Street in Chapel Hill is an elegant hotel that resembles an Italian Tuscan Villa– the Siena Hotel and Il Palio restaurant. At first glance, it’s easy to see why this richly appointed Autograph Collection boutique hotel and restaurant has consecutively received the AAA Four Diamond Award since 1987 with its luxurious resort-like property. However, the true treasure can be found inside the Il Palio restaurant with its Executive Chef Teddy Diggs. Chef Teddy is fairly new to the Triangle area since moving here a year and a half ago with his family from Martha’s Vineyard. As a father of two girls ages 7 and 5, Chef Teddy and his wife were looking for a place to plant roots and raise their family. Good schools, an international influence and nearness to family were major selling points to relocating his family to Chapel Hill, but the chart topper was a career opportunity at the Il Palio with management that was willing to provide a work/family life balance for their executive chef. Currently the Il Palio restaurant is undergoing a major overhaul and renovation which includes new flooring and upholstery, but also a custom wood-fired grill (one of the first in this region) and new menu items including rethought pasta dishes, crostinis, and a wine collection boasting a collection from the 20 regions of Italy. While the restaurant is closed, Chef Teddy has been connecting and sharing his love of cooking in the Triangle community he now calls home. 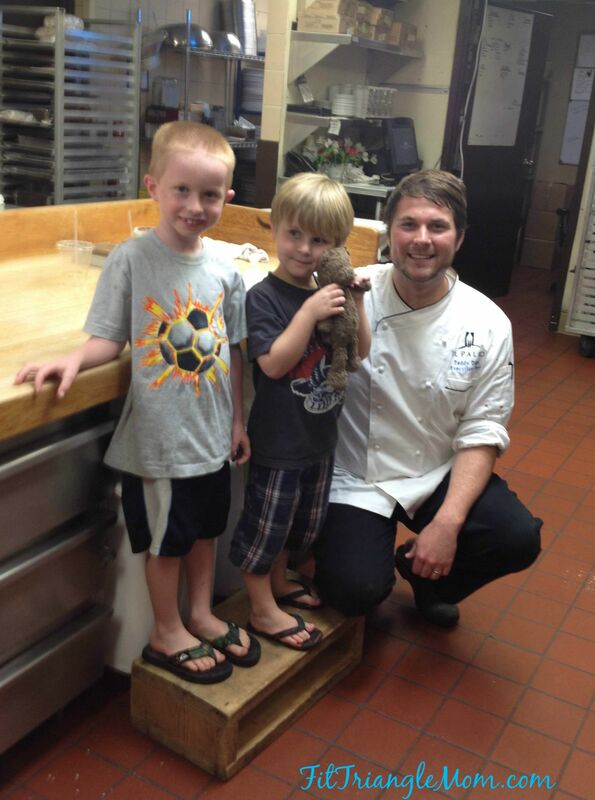 My boys, Aiden (7) and Liam (4) had the opportunity to meet and cook with Chef Teddy. My youngest Liam was enthusiastic to meet a Chef that shared the name with his special lovey bear, Teddy. Liam has since changed his bear’s name to Chef Teddy after meeting Il Palio’s executive Chef. 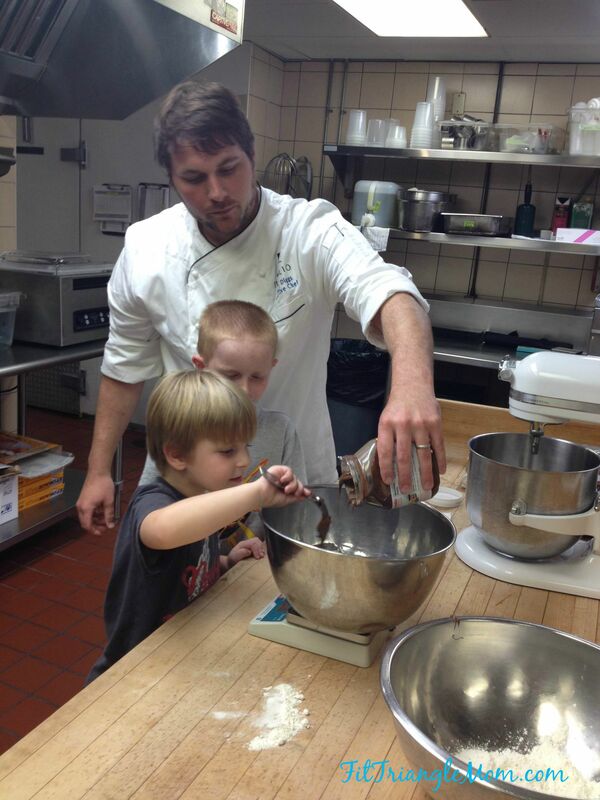 The 31-year-old dad and chef surprised the kids with the honor of baking Nutella Cookies (see below for a printable recipe) in the Il Palio kitchen. The cooking session began with thoroughly washing their hands in which Chef Teddy instructed the boys to sing the Happy Birthday song twice before drying their hands. With clean hands and eager smiles, the boys took turns cracking eggs into the shiny silver bowl and then measuring the ingredients. Chef Teddy had the boys use a scale to measure the flour, Nutella, and baking soda into the bowl. Their little fingers pinched flour in and out until the correct amount of grams was reached. With his commercial grade Kitchen Aid mixer, Chef Teddy mixed all the ingredients together. Mixing ingredients thoroughly is the key to baking, Chef Teddy explained to the kids. While the cookies baked in the oven, Chef Teddy shared how his passion for cooking started when he was kid. Raised in a military family and constantly moving to a new location every two years, Chef Teddy used his new stations to his advantage to learn a different cooking cuisine. When he lived in Newport his mom and him had a challenge to try all the different types of clam chowders served throughout the region. The cooking spark ignited in the 3rd grade when Chef Teddy watched the up and coming Food Network with star chefs like Emeril. It wasn’t all about the cooking for Chef Teddy, but more about the smiles and making people happy. Happy and overjoyed were the looks on my boys faces when Chef Teddy pulled the cookie sheet out of the oven and placed a cookie for each boy on their plate. They boys were too excited to wait for the ice cream and powdered sugar that Chef Teddy wanted to add to these decadent cookies. They impatiently took a bite of their cookies and with smeared Nutella on their faces thanked Chef Teddy for sharing his kitchen with them and teaching them the importance of cooking– making people happy. We want to share our happy with you. Click the picture below to get a free printable of the Nutella Cookie Recipe. Enjoy! Do you bake with your children? If so, please share in the comments below. 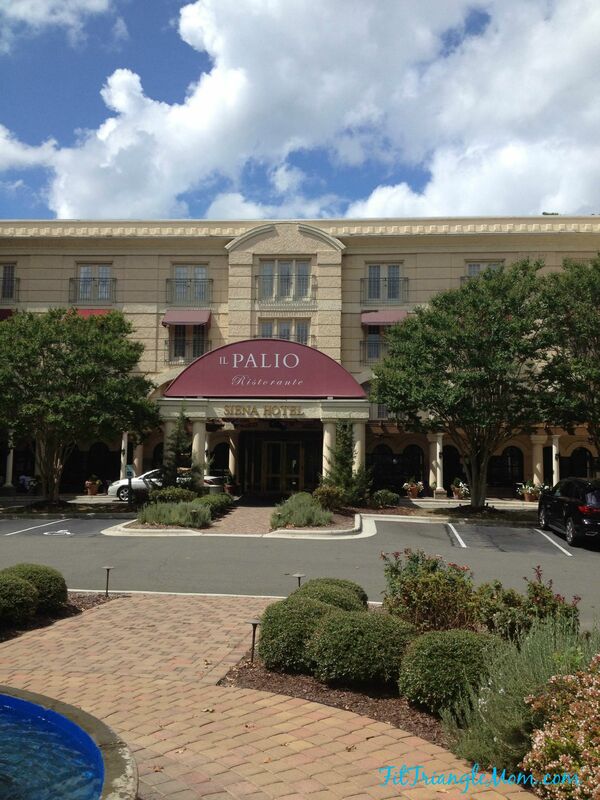 The Il Palio restaurant reopened on September 29, 2015. It’s a restaurant suitable for families and special occasions alike. Thanks, Leigh. It was a fun experience. Look at those smiles 🙂 What a fun post! Thanks, Rachel. I love watching my kids smile. This was such a fun experience and a pleasure to write. Tiffani recently posted…It’s National Read A Book Day! My boys keeping asking me to make more Nutella cookies. They were delicious. Thank you. Trying new activities and adventures is my favorite thing to do with my kids. It was such such a fun experience. Thank you. I tell them that are my models when we work on a job together. What an awesome experience I bet that was. That is so wonderful to have a chef in the community teaching kids the joy of cooking. I enjoy meeting people in my community. I’m glad Chef Teddy shares his talent with the community. We are lucky to have such a sweet chef. Thank you. It was fun taking the pictures. I’m not much of a cook, so I enjoyed sharing this experience with my kids. It’s good getting out of your comfort zone and learning new things. Your apple and pumpkin bread sounds delicious. My boys have been begging me to make Nutella cookies at home. I better get to the store and buy more Nutella. Thanks, Pam. This was such a fun experience. How wonderful to have such a great opportunity. you community seems to be extremely lucky. I personally love to bake and my daughter Dillon (11) loves to cook as well. We spend alot of time cooking together. I wonder if I could find an opportunity like this for here in my community. She would be thrilled. At the very least we will spend a little quality time together baking up these cookies. Thank you for sharing the experience and the receipe. That’s great that you and your daughter cook together. Is there any cooking schools or classes in your community? Maybe talk with a non-chain restaurant about cooking with the chef. I’ll ask Chef Teddy about finding cooking opportunities in your community. How fun. The kids looked like they had a great time. I wonder if I could organize something like this for my kids or even kids in the community. That would be awesome. Those cookies look yummy. It’s really cute that he renamed his bear. My friends’ kids come over and bake with me occasionally. Too cute! I love that he was willing to bake with children, and it makes sense since he own love for cooking started when he was so young. I don’t have children of my own, but when I worked as an early childhood educator I would often bake with the 3-5 year olds. They love it! That is cool that your sons got to cook with the chef. Keeping them in the kitchen and enjoying The cookies do look delicious. Were they? My boys enjoyed this experience immensely. I love opportunities like this. What a wonderful experience your children had! I try NOT to bake with my kids now. They are 13 and 18 and eating the delicious things we enjoy baking only makes me have to hit the gym harder…ouch! I understand. Baking cookies is a special treat. That’s great. We need to teach our boys some skills in the kitchen. Chef Teddy is very generous and the boys very cute. I would love one of those cookies, they look yummy. Thanks. The cookies are delicious. I hope you try the recipe. Thank you. The cookies were delicious. 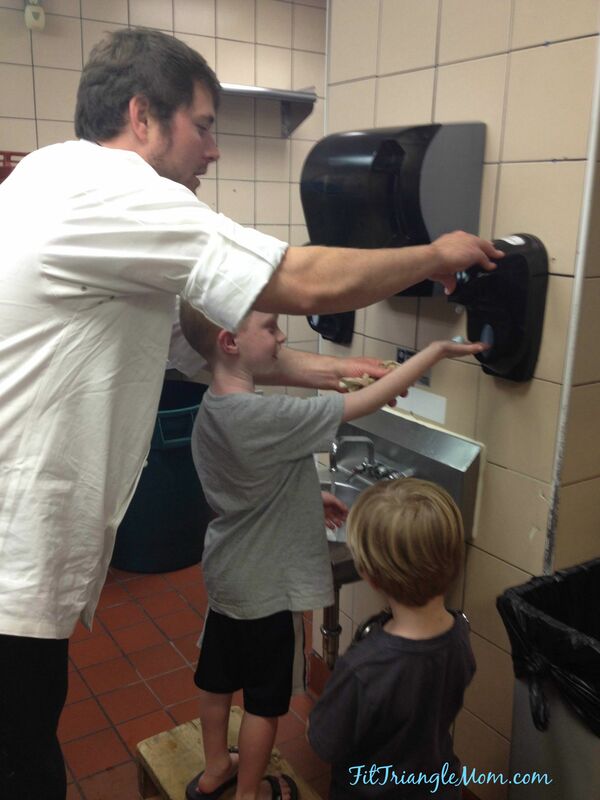 What a great experience for your kids but I bet it was an even better experience for Chef Teddy! Those cookies look delicious and by the looks on your boy’s faces, they agree. Looks like a fun experience for your boys. I love the teddy bear. The boys had a wonderful time. Cute, how the bear shared the Chef’s name. I love how Chef Teddy can come down to the kid’s level to teach them this great recipe. My kids are older now, but I took them to do cute things like this, it has given them a great passion to want to cook. I know that this experience will stay with the kids. I hope the kids remember doing things like this. One of the fun aspects of blogging. This is such a cool idea for kids. I would love the opportunity to cook in a real kitchen. I’ve been tempted to see if there’s kitchen space near my home that I can rent by the house to make dog food. Not the same as cookies, but the dogs get excited about it. That would be neat to find. Maybe a dog food truck? What a wonderful experience and the cookies look fabulous! YUM! The cookies were delicious. The recipe is super easy. Fun time and the cookies look so good. I’m thinking I can turn them to my lower carb baking and still get the hazelnut and chocolate taste. Thanks for the inspiration. How would you tweak this recipe to make it low- carb? How cool is that to bake with a chef? Looks like your boys had fun and those cookies looks yummy! It was a fun time and the cookies were delicious. Wonderful! I can see those little happy faces! Lear to cook directly from the chef are always great! Yes, it was an amazing experience. What a fun experience 🙂 I loved cooking with my parents/grandparents when I was a kid, and I most definitely will continue the tradition when I have little ones of my own. Plus Nutella cookies?! yum! I let my kids help me cook at home, but I’m not much of a cook. What a sweet memory. I’m trying to treasure this age even when it gets chaotic. Omg Nutella Cookie :0 that cant be real and your children are adorable. I love the Nutella recipe. It’s yummy and easy to make. I am sure your kids were just in heaven after this and how they got an insiders look into being a chef. And kudos to the chef for being such a good sport! Our community is grateful for Chef Teddy. Such a nice guy. The boys enjoyed cooking with him. I love the idea of cooking in a real kitchen. I’ve always wanted to do that and even looked online for local kitchens to rent by the house. I make my own dog food and would love the space that a professional kitchen offers. That would be cool. Maybe the SPCA has something. What a cute family! I am not too far from you; I’m going to have to come visit your restaurant sometime! The restaurant reopens on Sept 29. I’ll be sharing more from this place. Just keep cooking. That’s what chef Teddy did. Then he worked at a pizza restaurant before attending culinary school. That is so precious! The pictures are cute. It sounds like a really neat restaurant. Wishing them success with their opening! Thank you. Grand reopening is Sept 29!! My boys love to bake, so the experience was quite fitting. Maybe start with break apart cookies. Less time and mess. That is a such a great opportunity for your little ones. My daughter who is 4 loves to help me with cooking. As soon as she sees me enter the kitchen, she runs and gets her stool. Learning to cook or at least gaining an understanding of food at such a young age is very important. It sets a great tone when it comes to healthy eating at an older age. Kudos to you for allowing them to do this. Thank you. I’m not much of a cook, so this was a fantastic experience. Look delish, and like a great experience too! These cookies look and taste great! How sweet! Your sons looked so happy! What a fun experience for them. Nutella cookies?? My kids will be all over that! My daughters love to bake so we’ll have to put these on the list for Christmas 🙂 Very neat that you took your boys to cook with a real chef. What a cool experience for them. And I’m sure it was a win-win for the new chef in town to get to connect with others! Such an awesome adventure this was! Look at those happy faces! Yes – I bake with my daughter – it opens up a lot of talk! That’s sweet that using baking time to chat with your daughter. I enjoy my little helpers in the kitchen too. You should seek out a local restaurant to offer an experience like this for your kids. I agree. An activity with a sweet reward! Plus the recipe is super easy. I baked and cooked with my children when they were young. They are now young adults and love to cook, which is such an important skill! This outing looks like your kids had some fun! Such an awesome reminder that what we teach our children sticks with them when they grow up. Especially, when we make it fun. 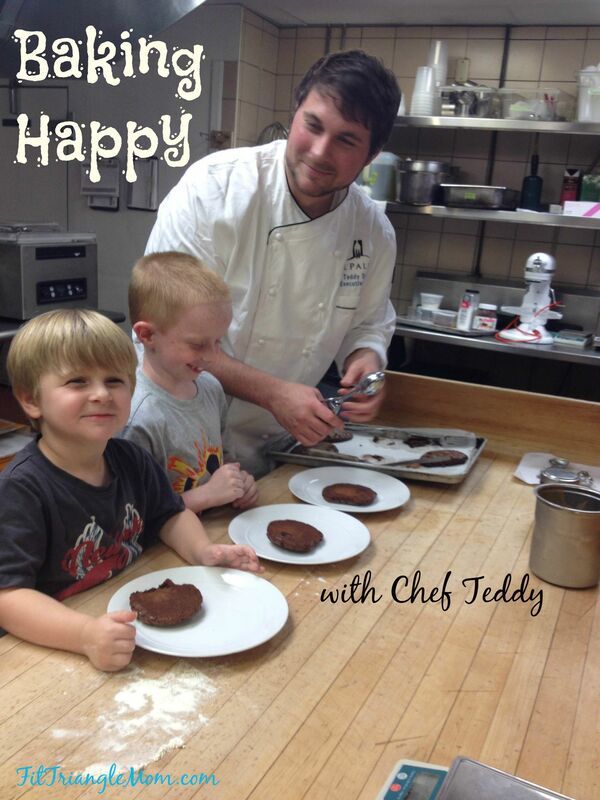 What a fun experience for your children to have a chance to cook with Chef Teddy! It looks like they had a blast! It was one of those memorable experiences. We hope to visit Chef Teddy again soon. The restaurant re-opened on September 29th. That’s super cool, Jill. The restaurant opened September 29th.